What Is The Difference Between Shin Splints And Stress Fracture? →What Is The Difference Between Shin Splints And Stress Fracture? As a runner, it is inevitable that at one time or another you get injured. Some injuries common to runners are simple sprains while others are serious fractures. Determining the kind of fracture you have is a major step to recovery. One of the common mistakes made is determining the difference between shin splints and stress fractures. This article will help you differentiate the two. What Is ﻿A Shin Splint? A Shin Splint can be used to describe discomfort that is felt along the shin bone. It happens when small tears appear in the lower leg muscle that causes an aching, shooting pain when running. The pain felt often disappears when you stop running or lower your intensity. If you have a shin splint, low-intensity activities such as walking do not cause any pain. Overuse is the main cause of a shin splint. Some factors can trigger this condition including inadequate stretching, running in the same direction on the track. A shin splint usually occurs on the foot that is used the most. Two sites may be affected by a shin splint. First, the area outside of the leg or the anterior area. Discomfort in this part of your leg may be because of an imbalance between the front leg muscles and the calf muscles. This kind of shin splint is often experienced by new runners whose muscles haven’t adjusted yet. The second site that may get a shin splint is inside of the shin. This is not a common condition compared to the latter. One way to determine whether you have a shin splint or something else is to press your fingertips along your shin. If you can find a specific spot that is extremely painful, you may have a stress fracture. Shin splints, on the other hand, are painful when you exert pressure on them such as when you try to lift your foot or flex it. Stress fractures, on the other hand, are commonly experienced in the lower part of the Tibia. In most cases, the pain is localized. One way to determine whether you have a stress fracture is putting your foot on the ground, if it is painful, you probably have a stress fracture. Pain is experienced in the lower part of the shin and you will also feel a tenderness with swelling in the area. Unlike a shin splint, the pain continues even when you do low-intensity activities such as walking. A stress fracture is caused by a small crack in the bone. It can also be triggered by a bruised bone. One of the most common causes of a stress fracture is overuse. When you switch to new exercises such as increase the intensity of your workout, you may trigger a stress fracture. It is also common among runners and basketball or soccer players. The bones in the foot and leg absorb a lot of stress during highly intense activities such as running. Because of this, they are more prone to stress fractures.Additional causes of a stress fracture are improper technique which may be triggered by having a blister or wound that affects the way you move. A less serious condition that may mistaken for a stress fracture is extensor tendonitis which is different in the sense that it is only an inflammation because of overuse of the tendons. It affects the extensor tendons that run from the front of your leg to the back of your foot. Symptoms include pain on the top of the foot with swelling. One of the first things to do if you suffer from a stress fracture in your foot or ankle is to take a break from intense activities including running. Returning to running before you are completely healed not only postpones the healing process but increases the risk of worsening the fracture. Since it will take about 6-8 weeks for the stress fracture to heal, you need to minimize your activities and switch to swimming and cycling. Once you get injuries from Shin Splints and Stress Fracture, you have to skip off the road up to 2 months until fully recovering. It sounds terrible for runners like us. Including some simple exercises could help you to prevent these injuries is a good idea. Find some simple workout with detail explanation for each step below. 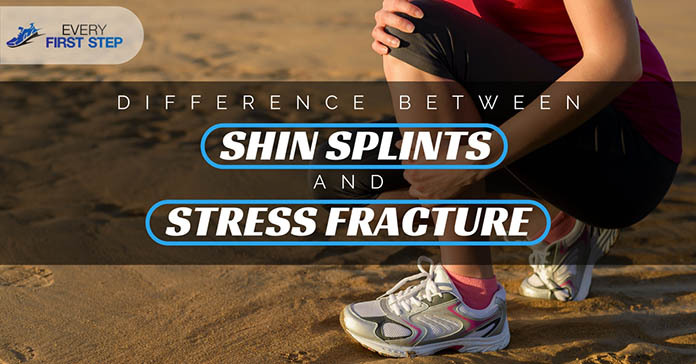 Determining the difference between a shin splint and a stress fracture can help you address the issue and prevent it from escalating. Remember that if the pain subsides when you walk, it is a shin splint but if the pain continues even with low intensity, it is a stress fracture. Did you find this article helpful? We’d love to hear your thoughts in the comments below.